Want a change from the Christmas/New Year festive meals? 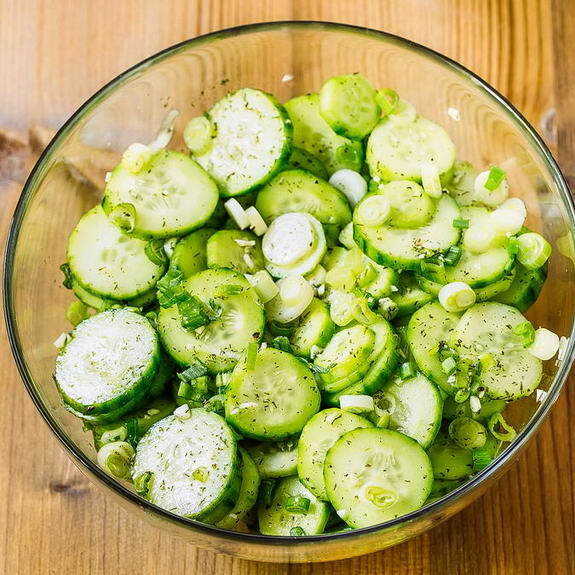 How about a light cucumber salad. “On hot summer evenings, I generally prefer to eat light. Before I ate Paleo, sometimes I would just have fresh veggies in a light salad with some dressing. And while there are days I could probably be totally satisfied with just veggies, I know now that I have to add protein to make sure I stay full longer; those veggie-only dinners would generally lead a few hours later to snacking. So when I’m in that mood, I’ll cook a piece of fish and pair it with a bright, flavorful salad. 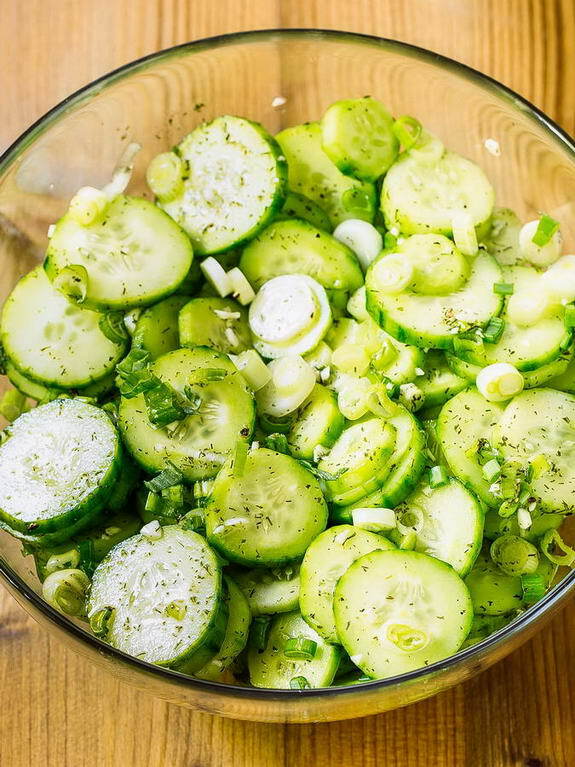 One of my favorites is this cucumber salad. I have a friend who often orders salads at restaurants but she almost always asks for the salad without lettuce. Inevitably, there’s always someone at the table who is befuddled by this. Julie always answers the same way: “iceberg lettuce is a waste of chewing time.” Now, I’m not as anti-lettuce as Julie, but I see her point. There are very few vitamins and nutrients in iceberg lettuce (the kind of lettuce most restaurants use for salads) and why not focus on the good stuff in the salad? Peppers, cucumbers, tomatoes, carrots… mmm. So a while back, Julie got me thinking: why not make salads that really showcase a particular veggie? Or at least don’t make the lettuce the star. 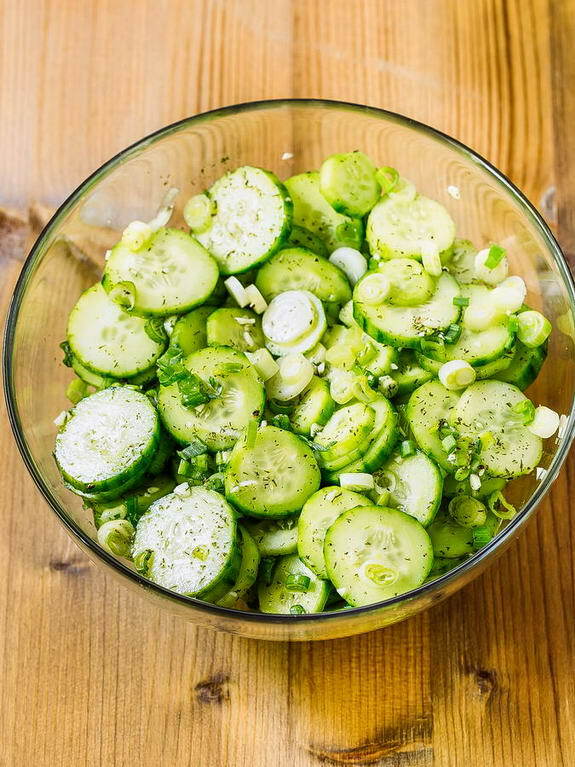 This cucumber salad was one of my first adventures into this veggie philosophy. To be honest, there’s nothing really genius about this recipe. It’s essentially a veggie with a vinegar-herb dressing, and if you’re courageous, you could definitely try variations on this theme. 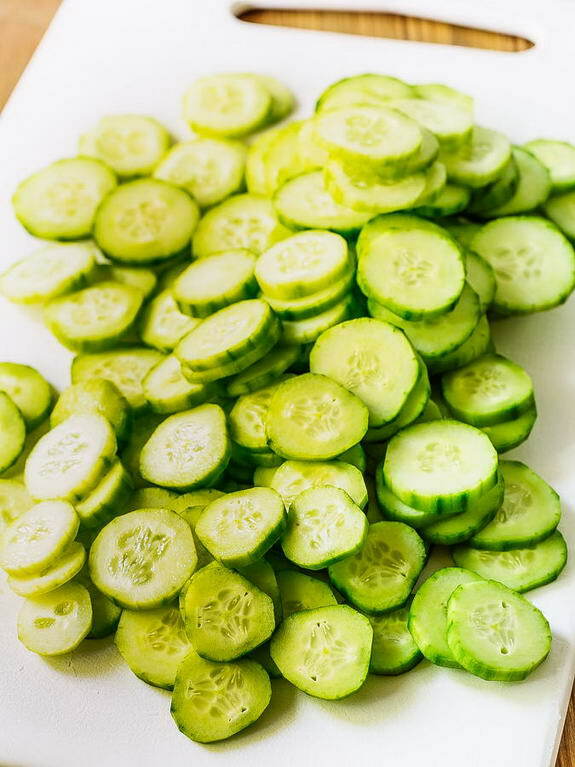 I picked cucumbers because they have a light flavor and they tend to soak up the juices and flavors they are dressed in, so each bite is super flavorful. But I could totally see a version of this salad using peppers, carrots, and even celery. And when I think “cucumber,” I immediately think “dill.” They just go so well together. I would use a different herb or spice flavor for a different vegetable. But dill is just perfect for cucumber. The spring onion (also known as green onion) and garlic add their flavor and almost spiciness to the mix, while honey gives it an almost imperceptible, but important, sweetness. You might be thinking, “why can’t I just slice up some cucumbers and pop open a bottle of store-bought dressing?” I encourage you to read the ingredient list and nutritional info before you do that. Most store bought dressings have a lot of sugar, preservatives, and other processed ingredients. If that doesn’t stop you from using store-bought dressing, this will: homemade dressings like the one used in this recipe simply taste better! 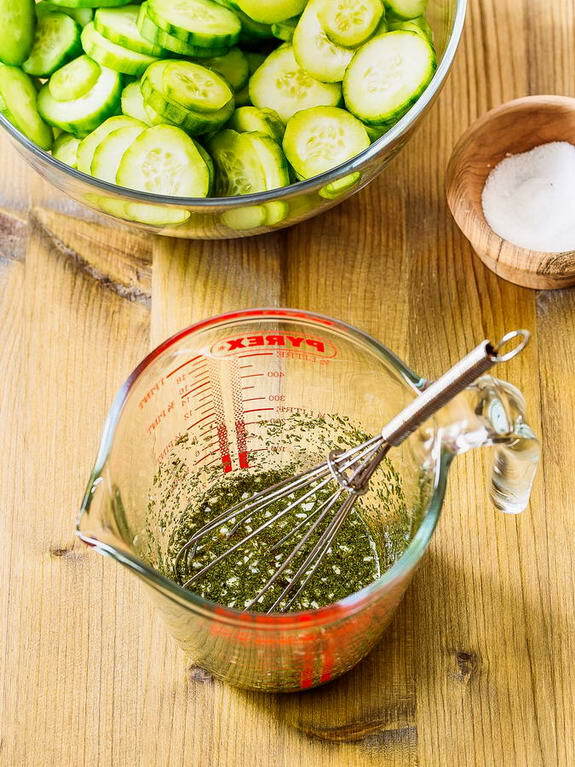 And you can always make extra and keep it in a screw-top mason jar in the fridge for a while to use on more cucumbers or other salads. Why not make extra and keep it in a screw-top mason jar in the fridge for a while to use on more cucumbers or other salads. 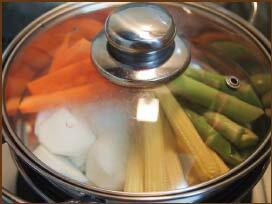 Slow-cooking vegetables is one of the gentler ways to prepare them, which makes it an excellent choice. You might lose some nutrients that leach into the slow-cooker water, but that’s only a problem if you don’t use the water. 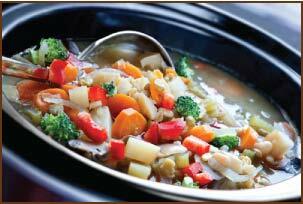 Fortunately, most slow-cooker dishes (soups and stews) make good use of the water. Keep your slow-cooker lid closed tight to trap the steam, which helps vegetable nutrients get into your body instead of going to waste. Consider stirring in some healthy fats (like olive oil), which help your body absorb “fat-soluble” vitamins found in vegetables (vitamins A, D, E, and K). You don’t have to leave veggies in the slow cooker for too long — just throw them in for the last hour. It’s a great way to cook your vegetables without over-exposing them to heat. Steaming is an extremely gentle cooking method without a lot of water loss. This helps vegetables keep their nutrients. Vitamin C is one of the easiest vitamins to destroy. But a 2006 study published in the journal Food Additives & Contaminants found that steaming broccoli didn’t damage its vitamin C content. Many vitamins in vegetables (vitamins A, D E, and K) are “fat soluble,” which means your body absorbs them better with fat. So if you eat steamed vegetables without adding fat, your body won’t absorb those important nutrients! You can avoid this by adding healthy fats like coconut or olive oil to your steamed vegetables — they taste great, and help your body get the most out of every vegetable. Did you know that frying your vegetables is actually one of the healthiest ways to cook them? There isn’t any water to drain, so you don’t have to worry about losing vitamins and minerals that way. 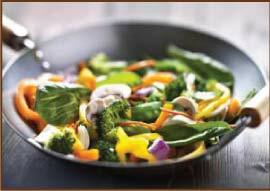 Frying takes high heat, but it cooks vegetables in a short period of time. You throw them into a pan, cook them, and take them off before they lose nutrients. A study published in the International Journal of Food Sciences and Nutrition found that fried potatoes had the same vitamin C content as raw potatoes. And vitamin C is one of the most vulnerable to heat! The biggest issue with frying comes down to the oil you choose to fry with. Processed or hydrogenated oils (the ones fast food restaurants use) are DESTROYED by high heat. They stress your system and make you inflamed. Coconut oil is a better choice. It’s one of the most stable healthy fats you can cook with, and holds up even in the high heat of a frying pan or wok. While steaming broccoli might be better than boiling it, eating boiled broccoli is light years ahead of NOT eating any broccoli at all! Every cooking method has its pros and cons. It’s easy to get caught up in the details… and lose sight of the big picture. If you don’t know where to get started, the PaleoHacks Cookbook can help. It’s designed to help you overcome some of the most common sticking points that keep people from adopting a healthy diet and making it a lifestyle. It’s easy to get bored if you’re eating the same meals every day. Or frustrated when you’re exhausted from work, short on time, and don’t have any idea what to make. You’ll experience a whole new world of vegetables, prepared in different ways, that allow you to enjoy hundreds of delicious meal combinations you can make a central part of your new lifestyle.